Yesterday evening I finally felt well enough to organize and find homes for my new supplies. 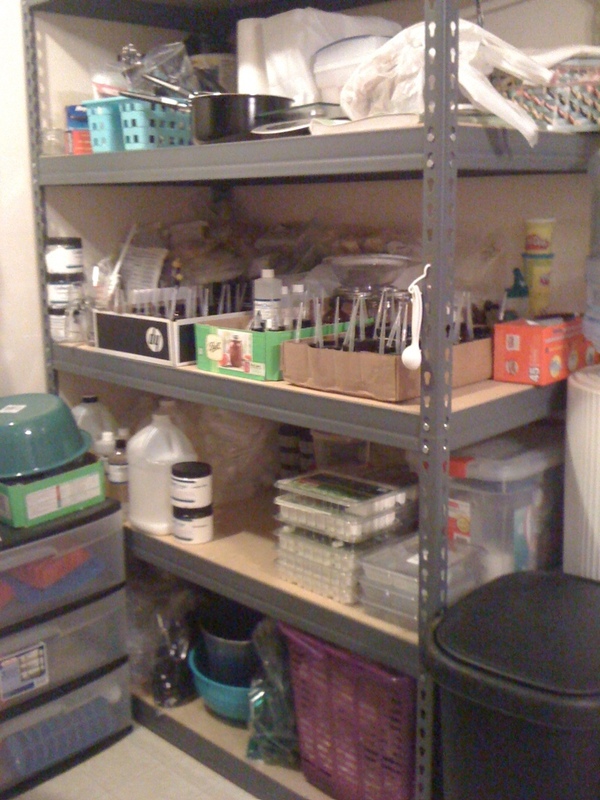 The shelf holding an army of pipettes coming out of the boxes is my oils and salts shelf. Um, I don’t have anymore room for oils after this last delivery! Lol. I will replace what goes empty, but I will not buy any new scents. Please remind me of this declaration when I make my next order. *grin* Jeepers! My upper shelf holds glass jars, bulk containers like the oats that I grind, the scale, and my sewing machine. Below that is my delightfully fun shelf of ingredients. Below that are different soap, lotion, shampoo, spray, and massage/body oil bases along with a few prepped plastic jars. At the bottom is mostly a ton of empty containers that I have been working at collecting during sales, so that I never have to make a customer wait a few weeks until I have the appropriate container. My purple yarn basket has become a bottle and lids basket for easy access. I thought ahead and got a tiny trashcan to take to events for people to toss sample spatulas, wet wipes, and paper towels. (Cue pat on my shoulder for truly learning from the cancer walk event!) The plastic unit to the left is full of soap molds (going to be a little fuller in a few weeks since I have four more silicone molds I found on sale through a mail order catalog. I figure that the silicone molds are an investment, so if they’re on sale and I can swing it, they shall be mine *failing miserably at the dramatic imitation*). You would be surprised (unless you are familiar with my need for things to be orderly, like my spreadsheets *grin*) how much of a relief being organized and stocked up is. Later today I’ll pull down my lotion-dedicated pots (on that upper shelf too) and start making new lotions hopefully. So exciting! Okay, my OCD has been satisfied and I gave more of a look at the meh aspects of making my stuff. *grin* I have an amusing (okay, amusing to me at least) pic to add, but otherwise it’s time to drift into a state of tramadol bliss. Lol.